Every summer, many people and their pets have to contend with pesky, prickly bindii weeds in their backyard. Unsurprisingly, we’re all keen to control it so we can comfortably sit or walk barefoot on our lawns. Bindii (soliva sessilis) is a common lawn weed originally native to South America. It’s now well established in many places around the world and has become particularly invasive in Australian backyards and sports fields. It’s a low-growing weed that first appears in winter with small feathery leaves similar to parsley, before developing a small bright flower. When it goes to seed in spring, it produces the prickly seed pod we all hate. Luckily, there are many easy and effective ways to control and remove bindii weeds. Management methods include removing bindii by hand, spraying your lawn and prevention measures like keeping the lawn well maintained. We’ll explore each method and look at their pros and cons. Like many nuisance weeds, the presence of bindii in your turf is telling you something about the health of your lawn. 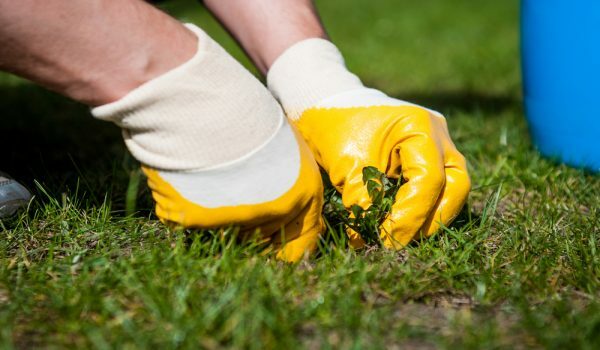 A healthy and well-maintained lawn is far less likely to be invaded by weeds. Water and fertilise your lawn regularly and raise the mower height to avoid scalping the grass. Turf that is cut too low can develop patches, inviting weed invasion. A high turf naturally prevents weeds by smothering them. Any bindii that develops can be effectively removed by hand pulling or hoeing over the seedlings. That being said, manual removal can be very tedious in a badly infested lawn or large area. Preventing bindii invasion through regular maintenance can be difficult and time-consuming, especially when you’re hit with extreme weather conditions. Dry weather, in particular, can cause lawns to thin out and die back. The most effective way to stop bindii from infesting your turf is to spray them in spray them in late winter or early spring as soon as the leaves appear and before the prickles develop. While it’s best to do this in late spring, herbicides will also work later in the year. The easiest control method is to blanket-spray all affected areas of the lawn with selective herbicides. This should kill bindii within 7-10 days. Most weed killers contain bromoxynil and MCPA. Herbicide products are sold under various trade names in small packs and will also kill other broadleaf weeds. Common products include Searles, Chemspray Bin-Die, Yates Weed n’ Feed and Spearhead. The same herbicides are also available in large packs for commercial use and large areas. The concentration of the active herbicide will vary in different products so it’s important to follow the manufacturer’s instructions on the label. Some products also contain dicamba. This is useful when other weedy clovers or oxalis species are present but is unsuitable for buffalo lawns and can harm nearby trees and shrubs. Knowing what kind of turf you have is crucial. Searles Bindii and Clover Killer is suitable to spray on many lawns including Couch, Carpet and Kikuyu. Searles Buffalo Master is a safe equivalent for Buffalo grass, Paspalum or rye grass lawns. Remember to refer to product labels for directions and to ensure it is suitable for your lawn. If you have any questions about lawn care and maintenance or are wondering which turf variety is best for your lawn, don’t hesitate to contact our team. Check out our lawn range and call us on 1800 887 253 for a chat.